1. Memorial of the Court of Directors of the Bank of England to the Lords of the Treasury. As to money imprested to their chief Cashier for charges of management, and the allowance made for fees paid to the Treasury and Exchequer: also as to fees paid to the Auditors. Pray for a further sum to be imprested to the Cashier. Signed: David Le Gros, Secretary. 6 April 1727. Minuted:—“15 July 1725. 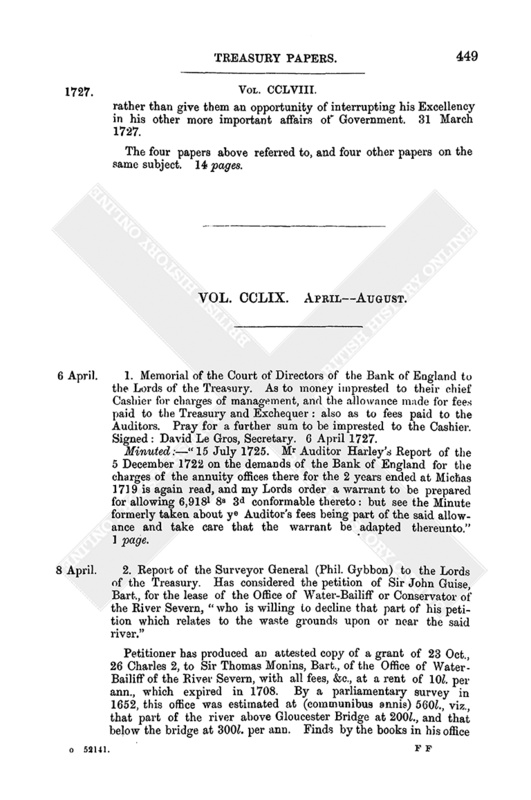 Mr Auditor Harley's Report of the 5 December 1722 on the demands of the Bank of England for the charges of the annuity offices there for the 2 years ended at Micħas 1719 is again read, and my Lords order a warrant to be prepared for allowing 6,918l 8s 3d conformable thereto: but see the Minute formerly taken about ye Auditor's fees being part of the said allowance and take care that the warrant be adapted thereunto.” 1 page. Petitioner has produced an attested copy of a grant of 23 Oct., 26 Charles 2, to Sir Thomas Monins, Bart., of the Office of Water-Bailiff of the River Severn, with all fees, &c., at a rent of 10l. per ann., which expired in 1708. By a parliamentary survey in 1652, this office was estimated at (communibus annis) 560l., viz., that part of the river above Gloucester Bridge at 200l., and that below the bridge at 300l. per ann. Finds by the books in his office that Mr Chomley (one of his predecessors) reported in 1718 on the petition of John Appletree, Esq., that a fine of 3,000l. might be a reasonable consideration for a lease of 31 years of this office, at the old rent of 10l. per ann. 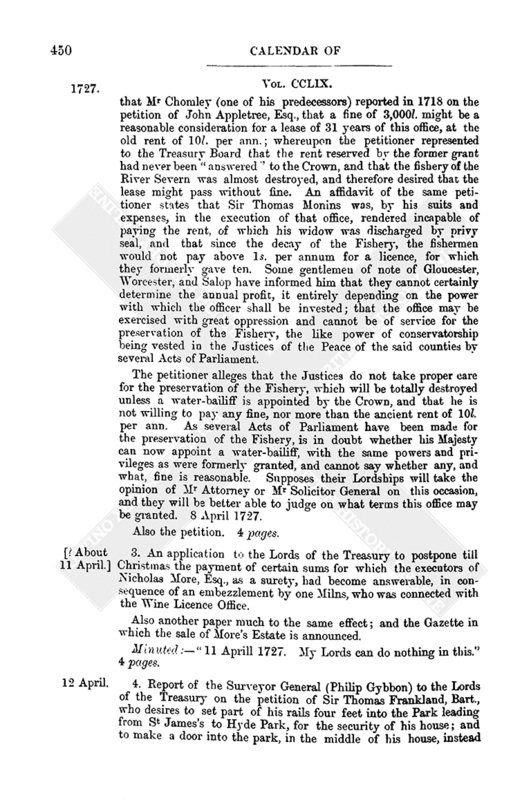 ; whereupon the petitioner represented to the Treasury Board that the rent reserved by the former grant had never been “answered “to the Crown, and that the fishery of the River Severn was almost destroyed, and therefore desired that the lease might pass without fine. An affidavit of the same petitioner states that Sir Thomas Monins was, by his suits and expenses, in the execution of that office, rendered incapable of paying the rent, of which his widow was discharged by privy seal, and that since the decay of the Fishery, the fishermen would not pay above 1s. per annum for a licence, for which they formerly gave ten. Some gentlemen of note of Gloucester, Worcester, and Salop have informed him that they cannot certainly determine the annual profit, it entirely depending on the power with which the officer shall be invested: that the office may be exercised with great oppression and cannot be of service for the preservation of the Fishery, the like power of conservatorship being vested in the Justices of the Peace of the said counties by several Acts of Parliament. The petitioner alleges that the Justices do not take proper care for the preservation of the Fishery, which will be totally destroyed unless a water-bailiff is appointed by the Crown, and that he is not willing to pay any fine, nor more than the ancient rent of 10l. per ann. As several Acts of Parliament have been made for the preservation of the Fishery, is in doubt whether his Majesty can now appoint a water-bailiff, with the same powers and privileges as were formerly granted, and cannot say whether any, and what, fine is reasonable. Supposes their Lordships will take the opinion of Mr Attorney or Mr Solicitor General on this occasion, and they will be better able to judge on what terms this office may be granted. 8 April 1727. Also the petition. 4 pages. 3. An application to the Lords of the Treasury to postpone till Christmas the payment of certain sums for which the executors of Nicholas More, Esq., as a surety, had become answerable, in consequence of an embezzlement by one Milns, who was connected with the Wine Licence Office. Also another paper much to the same effect; and the Gazette in which the sale of More's Estate is announced. Minuted:—“11 Aprill 1727. My Lords can do nothing in this.” 4 pages. 4. Report of the Surveyor General (Philip Gybbon) to the Lords of the Treasury on the petition of Sir Thomas Frankland, Bart., who desires to set part of his rails four feet into the Park leading from St James's to Hyde Park, for the security of his house; and to make a door into the park, in the middle of his house, instead of one now at the north-west corner of it. The Surveyor General thinks that what is asked for may be granted by a licence during his Majesty's pleasure. 5. Report of the Postmasters General (Ed. Carteret and E. Harrison) to the Lords of the Treasury. Having received the King's warrant for settling two packet-boats, for the conveyance of letters and packets between Gibraltar and Lisbon, or some other part of Portugal, for the manning the vessels, &c.; represent that one of the two packet-boats, lately employed on the Groin station, having sailed for Portugal, they gave immediate orders to have her stationed between Lisbon and Gibraltar. Have directed the Commander of the other Groin Packet-boat (which is detained by the Spanish Governor at Corunna) to repair forthwith to Lisbon, with directions for the Agent there to hire for him the most convenient ship for a packet-boat that can be procured, and to put her directly upon the station between Lisbon and Gibraltar. Have directed the strengthening the packet-boats which pass between Great Britain and Lisbon with ten men to each boat, together with guns and other arms and warlike stores. Ask approval for what they have done. Copy of the warrant referred to. 2 pages and 2 halves. 6. Fr. Negus to Mr Scroope. Finds it impossible by any examination to contradict what Thomas Robinson and George Field charge for provisions, &c. for the tigers, civet-cats, and East Indian birds; but George Field charges 8l. for his care and trouble, after the rate of 10s. a week, being double the allowance made by their Lordships to Robinson. But Field alleges that since 8 Sept. he had the additional care of two tigers and two civet-cats, and that the tigers are so unruly that he spends much of his time in tending them, and has a man to help him, for whom he asks 10s. a week. John Combs has expended in Kensington paddock the quantity of provisions mentioned, and the prices are according to contract. He craves after the rate of 30l. per ann. As to the directions for the future maintenance and keeping the foreign beasts and birds, proposes that a daily sum be allowed the gardener for the same, viz., for each tiger 16d. per day, each civet-cat 4d., and each Indian bird 2d., for their meat, and 2s. 6d. to the gardener for his care and necessaries. Further proposes that the keeper of the beasts in the paddock shall make a monthly account of the number under his care, and of the provisions furnished for them; but no certain allowance can be made till such time as the alterations commanded by his Majesty have been made, and it is known what feed they may have from the herbage, for at present they are confined in enclosures which afford very little herbage, &c. The best check the nature of the thing will bear seems to be a frequent examination, &c. 19 April 1727. Also the directions given by the Treasury to make the above report. Dated 16 Feb. 1726–7. 3 pages. (1.) The value of the tithes of certain estates by them purchased which were sold by the Commissioners at the same rate of purchase as the other parts of the estates, but which the Company affirm belonged to the Crown, and therefore are not alienable by the Commissioners. (2.) The overcharge in the rental of the “Coalery” and salt works of the estate of Winton, which the Company affirm the Commissioners set up as yielding 1,000l. per ann., whereas the Company say these works produce no more than 600l. per ann., and they, having bought at five years' purchase, insist they are entitled to retain five years' purchase of the difference. (3.) Interest of the purchase money of the estates of Panmuir, Winton, Kilsyth, and East Reston, to the value of 2,071l. charged by the Comrs. (4.) “Two years' rents of such of the tenants of the estates by them purchased, as remained dutiful to his Majesty” during the Rebellion. On the 1st the opinion of the Advocate and Solicitor General is, that if any of the tithes belonged to the Crown the sale cannot defeat the right of the Crown, and the Company are entitled to a deduction. Cannot determine whether any of the tithes sold belonged to the Crown, but there are some suits touching these before the Court of Session. As to the second, it does not appear to them that the Commissioners did affirm that the coalery and salt works of Winton had yielded, or might yield, 1,000l. per ann. If they rated the value too highly they appear to have made some satisfaction to the Company by selling it at five years' purchase, whereas the usual rate for such casual rent in sales in Scotland is seven years' purchase. As to the third, it appears that on 4 Aug. 1721 the Company paid 6,600l. of 120,963l., the price of the four estates first purchased, and from thence till 19 Oct. in the same year they made several payments till the 120,963l. was nearly paid up, &c. “The Company agree to be charged with interest for the balance as if it was part of the principal, &c.
As to the last article, viz., the two years' rent of the tenants, the Company have laid nothing before them to countenance this demand. The tenants who remained dutiful had a right by law to detain those rents in their own hands, but as it does not appear that they remained dutiful, or demanded the rents, or had any right to them, it is conceived they had no legal claim. On the whole subject apprehend that the Company cannot be compelled to pay up the price without the proper allowances being made. London, 21 April 1727. With these are two balance sheets of the York Buildings Company's accounts between 1721 and 1728, apparently not connected with the above report. 7 pages (some of them double pages). 8. Representation made by the Directors of the Equivalent Company at their Court held 22 April 1727, to the King, viz., that, as the improvement of manufactures and fisheries in Scotland “is now endeavouring to be promoted” under the King's influence and protection, and that the fund of the Equivalent Company arises there, and is the only one of that nature, in that part of the Kingdom, the Company apprehend it would be a great advantage if they were authorized to borrow and lend money upon securities in Scotland only, and had the power of banking there. Pray his Majesty to grant letters patent under the great seal of Scotland to enable such of the proprietors of that Comany as will subscribe their stock for that purpose, to have the power of banking in Scotland only; and that the proprietors may be erected into a Corporation. 1 page. 9. Memorial of the Governor and Company of the Bank of Scotland. The Bank of Scotland was erected by Act of Parliament Anno 1695, and the act declares it unlawful for any other persons to set up a distinct “Company of Bank” within that Kingdom for 21 years, yet it seems plain from their being erected in a perpetual succession, that it was intended, in case the undertaking did succeed, they should continue the National Bank of Scotland, and that there was no thought that any other bank should be erected, but by the same legislative authority. The Company have executed their trust with very moderate advantage to the adventurers, and to the universal satisfaction of that part of the nation. 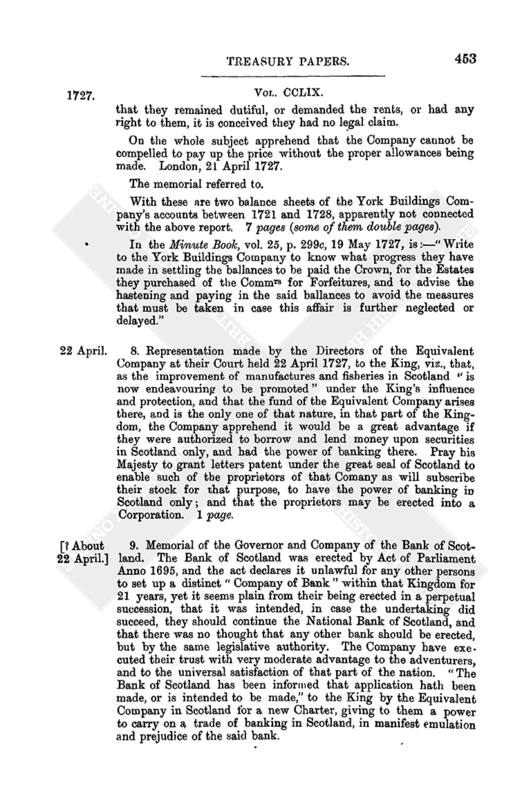 “The Bank of Scotland has been informed that application hath been made, or is intended to be made,” to the King by the Equivalent Company in Scotland for a new Charter, giving to them a power to carry on a trade of banking in Scotland, in manifest emulation and prejudice of the said bank. 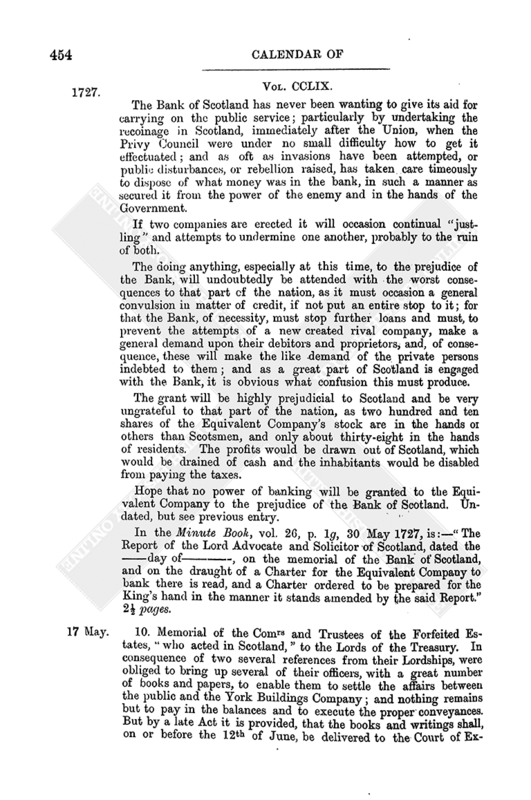 The Bank of Scotland has never been wanting to give its aid for carrying on the public service; particularly by undertaking the recoinage in Scotland, immediately after the Union, when the Privy Council were under no small difficulty how to get it effectuated; and as oft as invasions have been attempted, or public disturbances, or rebellion raised, has taken care timeously to dispose of what money was in the bank, in such a manner as secured it from the power of the enemy and in the hands of the Government. If two companies are erected it will occasion continual “justling” and attempts to undermine one another, probably to the ruin of both. The doing anything, especially at this time, to the prejudice of the Bank, will undoubtedly be attended with the worst consequences to that part of the nation, as it must occasion a general convulsion in matter of credit, if not put an entire stop to it; for that the Bank, of necessity, must stop further loans and must, to prevent the attempts of a new created rival company, make a general demand upon their debitors and proprietors, and, of consequence, these will make the like demand of the private persons indebted to them; and as a great part of Scotland is engaged with the Bank, it is obvious what confusion this must produce. The grant will be highly prejudicial to Scotland and be very ungrateful to that part of the nation, as two hundred and ten shares of the Equivalent Company's stock are in the hands or others than Scotsmen, and only about thirty-eight in the hands of residents. The profits would be drawn out of Scotland, which would be drained of cash and the inhabitants would be disabled from paying the taxes. Hope that no power of banking will be granted to the Equivalent Company to the prejudice of the Bank of Scotland. Undated, but see previous entry. In the Minute Book, vol. 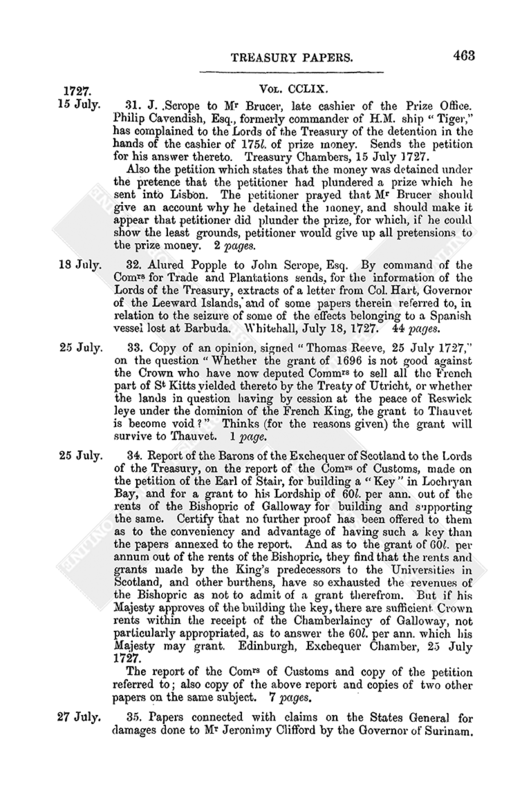 26, p. 1g, 30 May 1727, is:—“The Report of the Lord Advocate and Solicitor of Scotland, dated the —day of—, on the memorial of the Bank of Scotland, and on the draught of a Charter for the Equivalent Company to bank there is read, and a Charter ordered to be prepared for the King's hand in the manner it stands amended by the said Report.” 2½ pages. 10. Memorial of the Comrs and Trustees of the Forfeited Estates, “who acted in Scotland,” to the Lords of the Treasury. 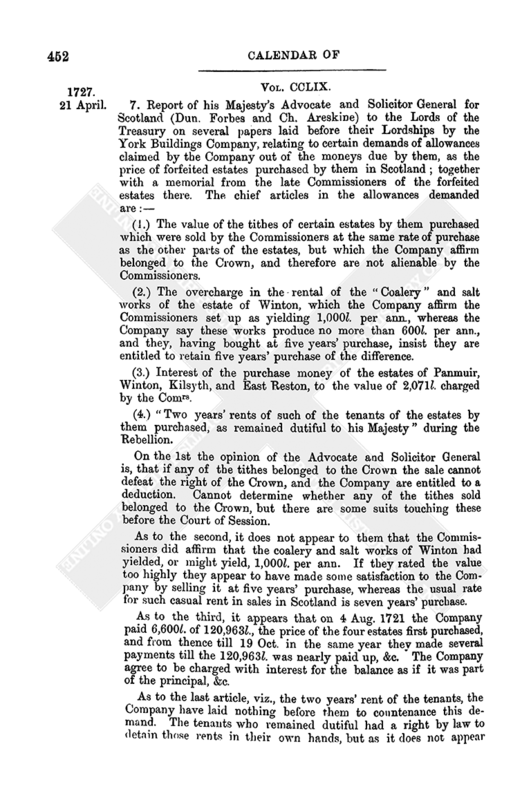 In consequence of two several references from their Lordships, were obliged to bring up several of their officers, with a great number of books and papers, to enable them to settle the affairs between the public and the York Buildings Company; and nothing remains but to pay in the balances and to execute the proper conveyances. But by a late Act it is provided, that the books and writings shall, on or before the 12th of June, be delivered to the Court of Exchequer. 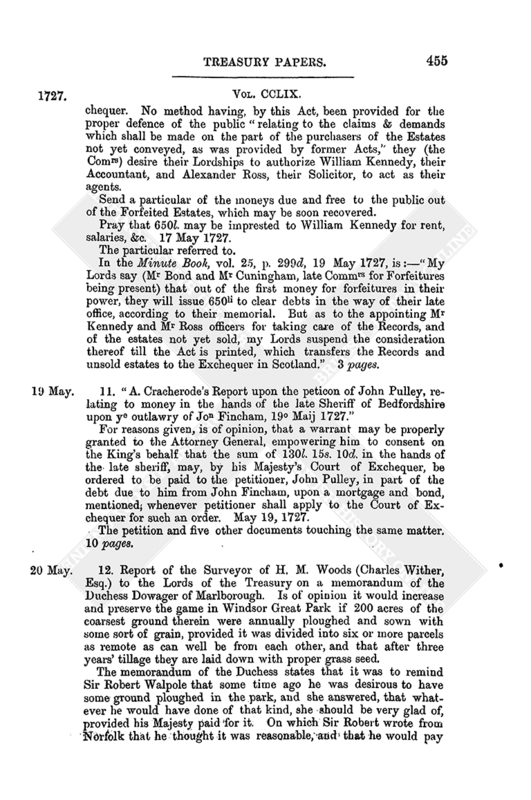 No method having, by this Act, been provided for the proper defence of the public “relating to the claims & demands which shall be made on the part of the purchasers of the Estates not yet conveyed, as was provided by former Acts,” they (the Comrs) desire their Lordships to authorize William Kennedy, their Accountant, and Alexander Ross, their Solicitor, to act as their agents. Send a particular of the moneys due and free to the public out of the Forfeited Estates, which may be soon recovered. Pray that 650l. may be imprested to William Kennedy for rent, salaries, &c. 17 May 1727. In the Minute Book, vol. 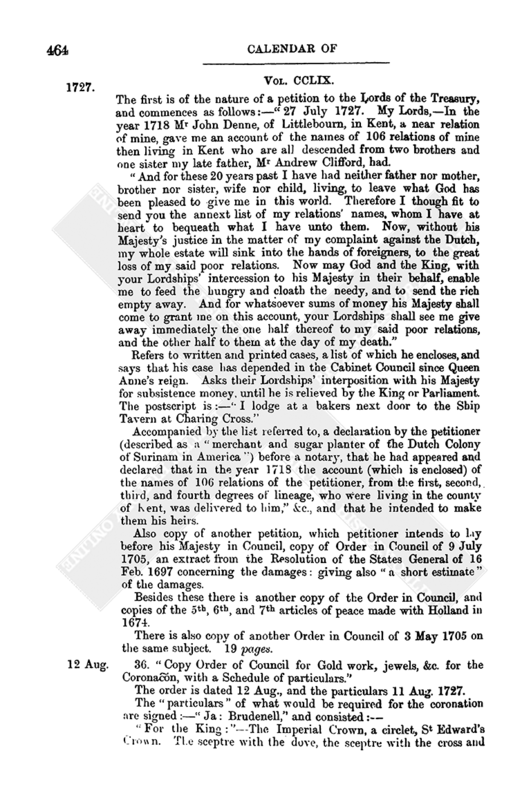 25, p. 299d, 19 May 1727, is:—“My Lords say (Mr Bond and Mr Cuningham, late Commrs for Forfeitures being present) that out of the first money for forfeitures in their power, they will issue 650li to clear debts in the way of their late office, according to their memorial. But as to the appointing Mr Kennedy and Mr Boss officers for taking care of the Records, and of the estates not yet sold, my Lords suspend the consideration thereof till the Act is printed, which transfers the Records and unsold estates to the Exchequer in Scotland.” 3 pages. For reasons given, is of opinion, that a warrant may be properly granted to the Attorney General, empowering him to consent on the King's behalf that the sum of 130l. 15s. 10d. in the hands of the late sheriff, may, by his Majesty's Court of Exchequer, be ordered to be paid to the petitioner, John Pulley, in part of the debt due to him from John Fincham, upon a mortgage and bond, mentioned; whenever petitioner shall apply to the Court of Exchequer for such an order. May 19, 1727. The petition and five other documents touching the same matter. 10 pages. 12. Report of the Surveyor of H. M. Woods (Charles Wither, Esq.) to the Lords of the Treasury on a memorandum of the Duchess Dowager of Marlborough. Is of opinion it would increase and preserve the game in Windsor Great Park if 200 acres of the coarsest ground therein were annually ploughed and sown with some sort of grain, provided it was divided into six or more parcels as remote as can well be from each other, and that after three years' tillage they are laid down with proper grass seed. The memorandum of the Duchess states that it was to remind Sir Robert Walpole that some time ago he was desirous to have some ground ploughed in the park, and she answered, that whatever he would have done of that kind, she should be very glad of, provided his Majesty paid for it. On which Sir Robert wrote from Norfolk that he thought it was reasonable; and that he would pay for it. Since this nothing had been done, because the Duchess expected he would give particular directions. Twenty-five years ago she found the park ploughed in several parts, which, as soon as she could she got rid of, because the bills she had on that account were more than 1,000l. a year; which made her think that it was reasonable for the King to pay for any extraordinary charge occasioned by his command. 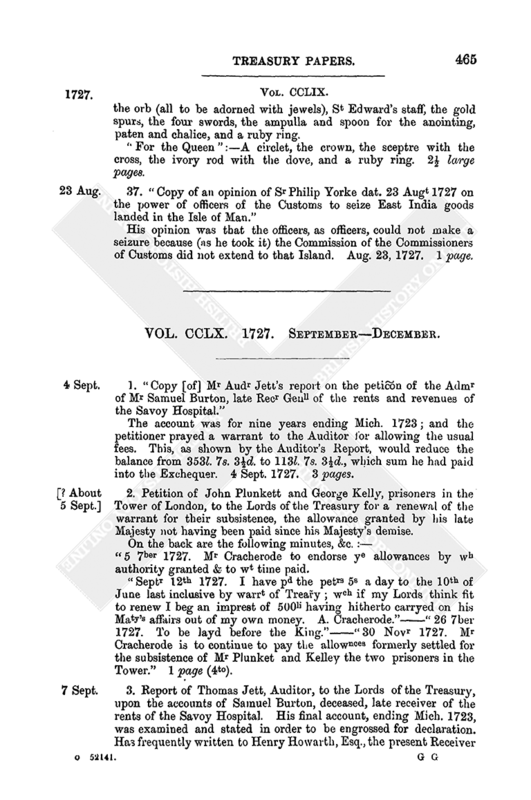 But, having been at the Lodge about six weeks, upon examining into that matter, she finds that what she formerly paid upon that account was a great abuse, and that she can plough any ground that is proper to be ploughed without any expense to the Crown, and with some little advantage to herself. A great part of the ground in the park is overrun with thistles and produces nothing that is of use. She would plough up one or two hundred acres every year at no charge to the Crown if she had an order from the Treasury. For she does not think it proper for her to do anything in this matter without orders. 2 pages. 13. 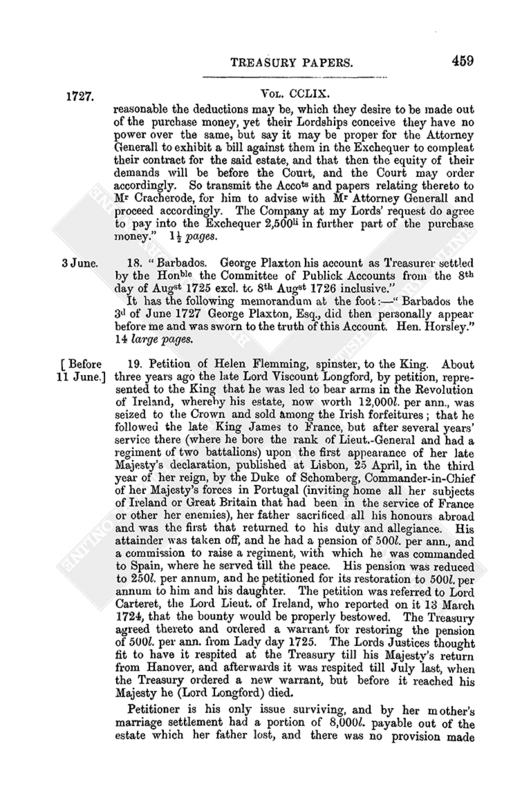 Report of the Surveyor General (Gybbon) to the Lords of the Treasury on the memorial of Thomas Burdus, Esq., who claimed the remainder of a term of 31 years' lease of the coal mines in Lanton alias Lampton Hills, in the common fields of Wickham, in the county of Durham, granted by letters patent of 28 Aug. 1697 to Thomas Neal, Esq., and Michael Thompson, gent. Memorialist prayed for another term of 31 years under the same rents, viz., 1l. 6s. 8d. per annum, and a sixth of the clear yearly value of the collieries. Has this day made his report on the several memorials of the Lord Viscount Vane and the Lord Barnard for a reversionary lease of the coal mines at Lanton Hills only, in the former of which he has given an account of the ancient as well as the present condition of the mines. As to the other colliery in the parish of Wickham, finds that King James I. on 28 Apr., in his 21st year, granted it to Alexander Stevenson for three lives, at a rent of 1l. 6s. 8d. per annum, without fines, and no lease appears to have been since made of it by the Crown till that in 1697. 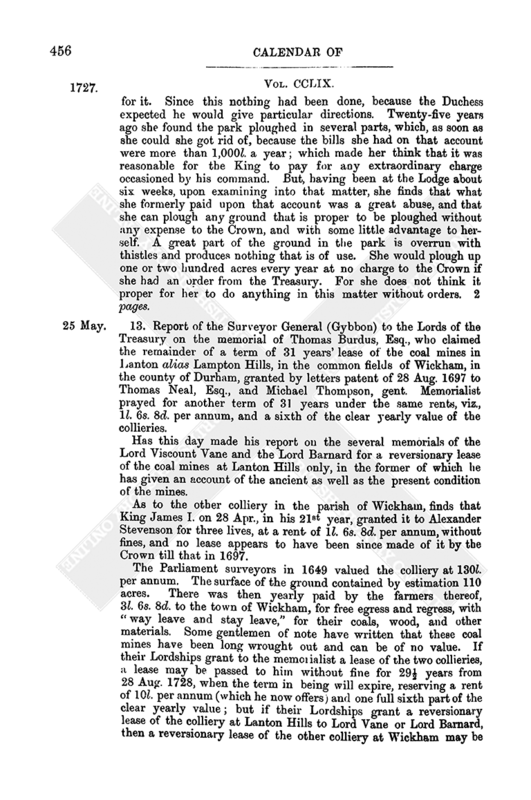 The Parliament surveyors in 1649 valued the colliery at 130l. per annum. The surface of the ground contained by estimation 110 acres. There was then yearly paid by the farmers thereof, 3l. 6s. 8d. to the town of Wickham, for free egress and regress, with “way leave and stay leave,” for their coals, wood, and other materials. Some gentlemen of note have written that these coal mines have been long wrought out and can be of no value. If their Lordships grant to the memorialist a lease of the two collieries, a lease may be passed to him without fine for 29½ years from 28 Aug. 1728, when the term in being will expire, reserving a rent of 10l. 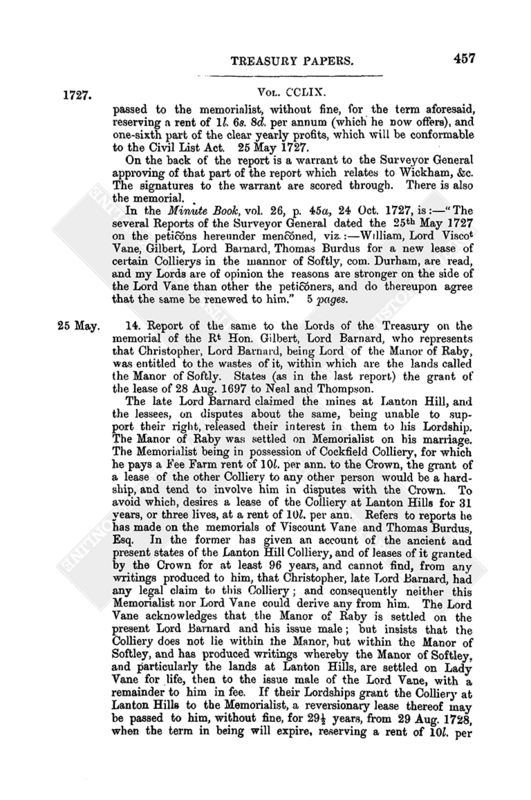 per annum (which he now offers) and one full sixth part of the clear yearly value; but if their Lordships grant a reversionary lease of the colliery at Lanton Hills to Lord Vane or Lord Barnard, then a reversionary lease of the other colliery at Wickham may be passed to the memorialist, without fine, for the term aforesaid, reserving a rent of 1l. 6s. 8d. per annum (which he now offers), and one-sixth part of the clear yearly profits, which will be conformable to the Civil List Act. 25 May 1727. On the back of the report is a warrant to the Surveyor General approving of that part of the report which relates to Wickham, &c. The signatures to the warrant are scored through. There is also the memorial. In the Minute Book, vol. 26, p. 45a, 24 Oct. 1727, is:—“The several Reports of the Surveyor General dated the 25th May 1727 on the petic[i]ons hereunder menc[i]oned, viz. :—William, Lord Viscot Vane, Gilbert, Lord Barnard, Thomas Burdus for a new lease of certain Collierys in the mannor of Softly, com. Durham, are read, and my Lords are of opinion the reasons are stronger on the side of the Lord Vane than other the petic[i]oners, and do thereupon agree that the same be renewed to him.” 5 pages. 14. 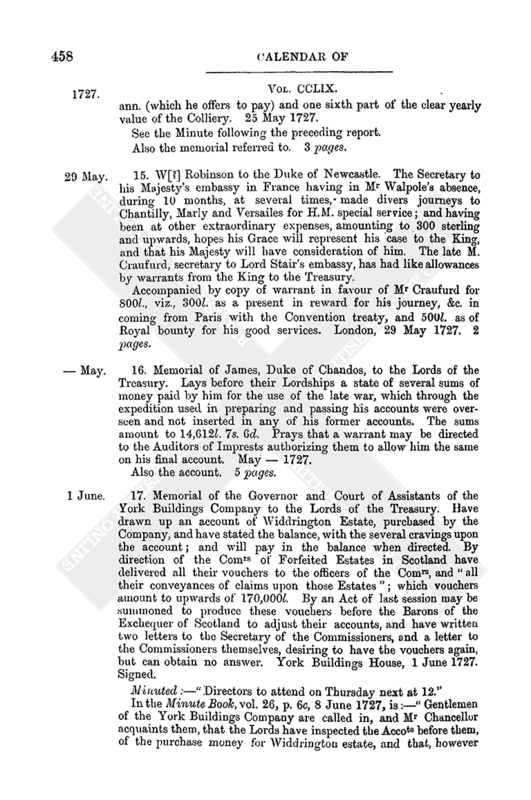 Report of the same to the Lords of the Treasury on the memorial of the Rt Hon. Gilbert, Lord Barnard, who represents that Christopher, Lord Barnard, being Lord of the Manor of Raby, was entitled to the wastes of it, within which are the lands called the Manor of Softly. States (as in the last report) the grant of the lease of 28 Aug. 1697 to Neal and Thompson. The late Lord Barnard claimed the mines at Lanton Hill, and the lessees, on disputes about the same, being unable to support their right, released their interest in them to his Lordship. The Manor of Raby was settled on Memorialist on his marriage. The Memorialist being in possession of Cockfield Colliery, for which he pays a Fee Farm rent of 10l. per ann. to the Crown, the grant of a lease of the other Colliery to any other person would be a hardship, and tend to involve him in disputes with the Crown. To avoid which, desires a lease of the Colliery at Lanton Hills for 31 years, or three lives, at a rent of 10l. per ann. Refers to reports he has made on the memorials of Viscount Vane and Thomas Burdus, Esq. In the former has given an account of the ancient and present states of the Lanton Hill Colliery, and of leases of it granted by the Crown for at least 96 years, and cannot find, from any writings produced to him, that Christopher, late Lord Barnard, had any legal claim to this Colliery; and consequently neither this Memorialist nor Lord Vane could derive any from him. The Lord Vane acknowledges that the Manor of Raby is settled on the present Lord Barnard and his issue male; but insists that the Colliery does not lie within the Manor, but within the Manor of Softley, and has produced writings whereby the Manor of Softley. and particularly the lands at Lanton Hills, are settled on Lady Vane for life, then to the issue male of the Lord Vane, with a remainder to him in fee. If their Lordships grant the Colliery at Lanton Hills to the Memorialist, a reversionary lease thereof may be passed to him, without fine, for 29½ years, from 29 Aug. 1728, when the term in being will expire, reserving a rent of 10l. per ann. (which he offers to pay) and one sixth part of the clear yearly value of the Colliery. 25 May 1727. See the Minute following the preceding report. Also the memorial referred to. 3 pages. 15. W[?] Robinson to the Duke of Newcastle. The Secretary to his Majesty's embassy in France having in Mr Walpole's absence, during 10 months, at several times, made divers journeys to Chantilly, Marly and Versailes for H.M. special service; and having been at other extraordinary expenses, amounting to 300 sterling and upwards, hopes his Grace will represent his case to the King, and that his Majesty will have consideration of him. The late M. Craufurd, secretary to Lord Stair's embassy, has had like allowances by warrants from the King to the Treasury. Accompanied by copy of warrant in favour of Mr Craufurd for 800l., viz., 300l. as a present in reward for his journey, &c. in coming from Paris with the Convention treaty, and 500l. as of Royal bounty for his good services. London, 29 May 1727. 2 pages. 16. Memorial of James, Duke of Chandos, to the Lords of the Treasury. Lays before their Lordships a state of several sums of money paid by him for the use of the late war, which through the expedition used in preparing and passing his accounts were overseen and not inserted in any of his former accounts. The sums amount to 14,612l. 7s. 6d. Prays that a warrant may be directed to the Auditors of Imprests authorizing them to allow him the same on his final account. May — 1727. Also the account. 5 pages. 17. Memorial of the Governor and Court of Assistants of the York Buildings Company to the Lords of the Treasury. Have drawn up an account of Widdrington Estate, purchased by the Company, and have stated the balance, with the several cravings upon the account; and will pay in the balance when directed. By direction of the Comrs of Forfeited Estates in Scotland have delivered all their vouchers to the officers of the Comrs, and “all their conveyances of claims upon those Estates”; which vouchers amount to upwards of 170,000l. By an Act of last session may be summoned to produce these vouchers before the Barons of the Exchequer of Scotland to adjust their accounts, and have written two letters to the Secretary of the Commissioners, and a letter to the Commissioners themselves, desiring to have the vouchers again, but can obtain no answer. York Buildings House, 1 June 1727. Signed. In the Minute Book, vol. 26, p. 6c, 8 June 1727, is:—“Gentlemen of the York Buildings Company are called in, and Mr Chancellor acquaints them, that the Lords have inspected the Accots before them, of the purchase money for Widdrington estate, and that, however reasonable the deductions may be, which they desire to be made out of the purchase money, yet their Lordships conceive they have no power over the same, but say it may be proper for the Attorney Generall to exhibit a bill against them in the Exchequer to compleat their contract for the said estate, and that then the equity of their demands will be before the Court, and the Court may order accordingly. So transmit the Accots and papers relating thereto to Mr Cracherode, for him to advise with Mr Attorney Generall and proceed accordingly. The Company at my Lords' request do agree to pay into the Exchequer 2,500li in further part of the purchase money.” 1½ pages. It has the following memorandum at the foot:—“Barbados the 3d of June 1727 George Plaxton, Esq., did then personally appear before me and was sworn to the truth of this Account. Hen. Horsley.” 14 large pages. 19. Petition of Helen Flemming, spinster, to the King. About three years ago the late Lord Viscount Longford, by petition, represented to the King that he was led to bear arms in the Revolution of Ireland, whereby his estate, now worth 12,000l. per ann., was seized to the Crown and sold among the Irish forfeitures; that he followed the late King James to France, but after several years' service there (where he bore the rank of Lieut.-General and had a regiment of two battalions) upon the first appearance of her late Majesty's declaration, published at Lisbon, 25 April, in the third year of her reign, by the Duke of Schomberg, Commander-in-Chief of her Majesty's forces in Portugal (inviting home all her subjects of Ireland or Great Britain that had been in the service of France or other her enemies), her father sacrificed all his honours abroad and was the first that returned to his duty and allegiance. His attainder was taken off, and he had a pension of 500l. per ann., and a commission to raise a regiment, with which he was commanded to Spain, where he served till the peace. His pension was reduced to 250l. per annum, and he petitioned for its restoration to 500l. per annum to him and his daughter. The petition was referred to Lord Carteret, the Lord Lieut. of Ireland, who reported on it 13 March 1724, that the bounty would be properly bestowed. The Treasury agreed thereto and ordered a warrant for restoring the pension of 500l. per ann. from Lady day 1725. The Lords Justices thought fit to have it respited at the Treasury till his Majesty's return from Hanover, and afterwards it was respited till July last, when the Treasury ordered a new warrant, but before it reached his Majesty he (Lord Longford) died. Petitioner is his only issue surviving, and by her mother's marriage settlement had a portion of 8,000l. payable out of the estate which her father lost, and there was no provision made for her. Has deeply shared in her father's misfortunes, and has sacrificed upwards of 2,000l. left to her by her friends, and stands engaged for 960l. more for the remainder of her father's debts. Prays to have the benefit of the warrant which was ordered for her father's late augmentation, from the commencement thereof to his death, and such further provision for her future support as shall seem meet to his Majesty. Undated, but before the death of King Geo. I. In the Minute Book, vol. 26, p. 49e, 31 Oct. 1727, is:—“Mr Chancellor acquaints my Lords * * * * that it is the King's pleasure also that Helen Flemming, daughter of the late Lord Viscot Longford, be added to the same Establishment [the Civil Establishment of Ireland] for 50li p[er] ann.” 1 page. 20. Memorial of the Nobility, Gentlemen, and Inhabitants living in, and near, his Majesty's Castle of Windsor, and the Borough of New Windsor, and the several seats and villages adjacent. Her Majesty Queen Anne, at the expense of the Crown, made a handsome large gravel walk, now called the King's Avenue, leading from the Palace of Windsor into the Park, called Windsor Great Park, and from thence up to a road going across the Park from Egham into the Forest of Windsor, and to the several seats and villages situated therein, which is a great ornament to the Castle, and is of great use and safety for the Royal Family and his Majesty's subjects to go from the Castle and Borough into the Forest to hunt, and to the several seats and villages therein; being the only road in the winter that is passable. The walk or road has been ever since repaired at the expense of the Crown; but by the wet season, and want of gravel, it is now ruinous and dangerous. Pray for orders to be given to repair the same. It has 42 signatures. 1 page. 21. 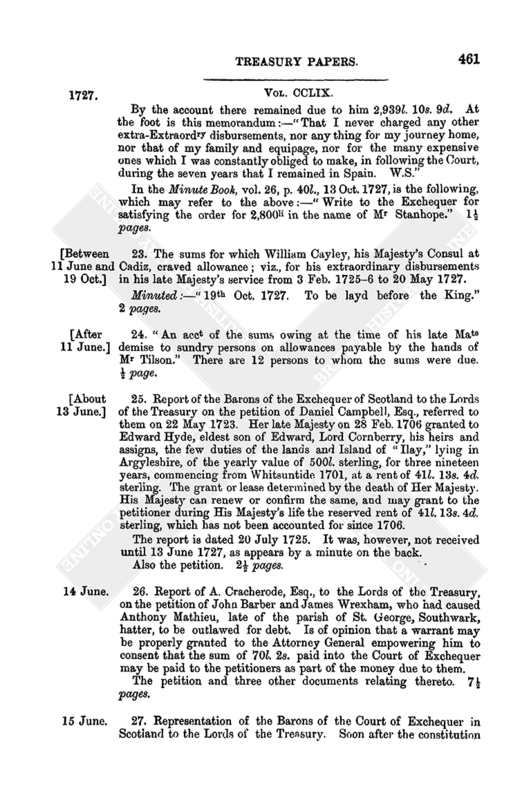 Abstract of the Accounts of Anthony Cracherode as “Solicitor for the affairs of his late Majesty's Treasury,” viz. : “to his late Maty's demise, shewing what his late Maty owed him, and what he must further disburse to get his accots passed. Wth an accot of what was due from his office at his late Maty's death.” 3 pages. 22. An account of money advanced for secret services by Wm Stanhope, Esqr, his Majty's late Ambassador Extraordry & Plenipotentiary at the Court of Spain, from the 20th May 1720 to the 11th June 1727. In the Minute Book, vol. 26, p. 40l., 13 Oct. 1727, is the following, which may refer to the above:—“Write to the Exchequer for satisfying the order for 2,800li in the name of Mr Stanhope.” 1½ pages. 23. The sums for which William Cayley, his Majesty's Consul at Cadiz, craved allowance; viz., for his extraordinary disbursements in his late Majesty's service from 3 Feb. 1725–6 to 20 May 1727. Minuted:—“19th Oct. 1727. To be layd before the King.” 2 pages. 24. “An acct of the sums owing at the time of his late Mats demise to sundry persons on allowances payable by the hands of Mr Tilson.” There are 12 persons to whom the sums were due. ½ page. 25. Report of the Barons of the Exchequer of Scotland to the Lords of the Treasury on the petition of Daniel Campbell, Esq., referred to them on 22 May 1723. Her late Majesty on 28 Feb. 1706 granted to Edward Hyde, eldest son of Edward, Lord Cornberry, his heirs and assigns, the few duties of the lands and Island of “Ilay,” lying in Argyleshire, of the yearly value of 500l. sterling, for three nineteen years, commencing from Whitsuntide 1701, at a rent of 41l. 13s. 4d. sterling. 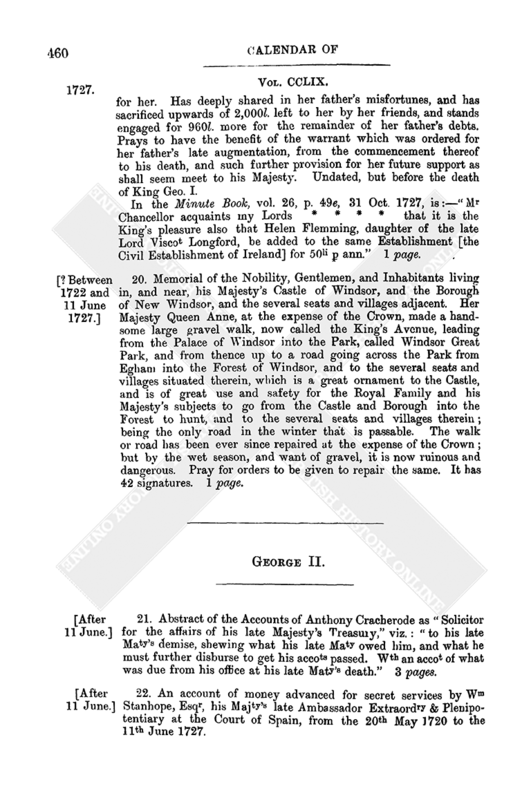 The grant or lease determined by the death of Her Majesty. His Majesty can renew or confirm the same, and may grant to the petitioner during His Majesty's life the reserved rent of 41l. 13s. 4d. sterling, which has not been accounted for since 1706. The report is dated 20 July 1725. It was, however, not received until 13 June 1727, as appears by a minute on the back. 26. Report of A. Cracherode, Esq., to the Lords of the Treasury, on the petition of John Barber and James Wrexham, who had caused Anthony Mathieu, late of the parish of St. George, Southwark, hatter, to be outlawed for debt. Is of opinion that a warrant may be properly granted to the Attorney General empowering him to consent that the sum of 70l. 2s. paid into the Court of Exchequer may be paid to the petitioners as part of the money due to them. The petition and three other documents relating thereto. 7½ pages. 27. Representation of the Barons of the Court of Exchequer in Scotland to the Lords of the Treasury. Soon after the constitution of “the court” it was found necessary for the better carrying on of the public service to have an agent or correspondent at London. Upon the death of Mr Richard Lerego in the year 1716, the Barons nominated and appointed Mr Joseph Tudor in his place. “The business incumbent on him” has much increased by the many public affairs put under management of the Court. The Court hitherto has only been enabled to make an allowance to Mr Tudor out of the fund for prosecutions and petty expenses. As their opinion is that Mr Tudor deserves much better encouragement, recommend that he be placed upon the establishment for civil affairs [in Scotland] at the rate of 200l. per annum. Edinburgh, Exchequer Chamber, 15 June 1727. 2 pages. 28. Memorial from the Comrs appointed by His late Majesty for building fifty new churches in and about the cities of London and Westminster and suburbs thereof, and for rebuilding the parish church of St Mary, Woolnoth, in the city of London, addressed to the Lords of the Treasury, desiring their Lordships to direct the further sum of 25,000l. to be raised by a loan at the Exchequer at four per cent. upon the credit of the fund of 21,000l. per ann. charged upon the duties on coals and culm. Old Palace Yard, Westminster, 19 June 1727. Seven signatures. 1 page. 29. Report of the same to the same, on the memorial of William Duff, of Bracco. There is due to the Crown upon the enfeoffment of the memorialist in sundry lands in the county of Banff and Regality of Kinloss the sum of 222l. 8s. 610/12d., of which his Majesty may, if he please, discharge the memorialist. 22 June 1727. In the Minute Book, vol. 26, p. 20d, 2 Aug. 1727, is a minute that the above report was “read and agreed to.” 2 pages. 30. Certified copy of representation of merchants and owners of ships in London to the Lords of the Treasury. Upon a trial lately had before the Lord Chief Baron upon the seizure of a ship for bringing goods from Holland which were of the growth of the East Indies, judgment was given against the claimant, Mr Van Neck, and the ship forfeited. Set out, that if the law is to be so strictly put in execution, without any regard to innocence, far from answering the intention of the legislature, which intended to encourage and increase shipping and navigation, it will necessarily prove the destruction of it, since the act of any common sailor or passenger by bringing over contraband goods with the view of disposing of them or of becoming informer will subject to forfeiture the property of innocent persons. Hope their Lordships will give directions for the relief of Mr Van Neck, and to prevent further accidents that may befall others who are daily liable to the like misfortune. The date of the original was 24 June 1727, and it was certified by a notary on 3 [? July] 1727. The name of the notary and the lower part of the document is torn away. 1 m. (parchment). 31. J. Scrope to Mr Brucer, late cashier of the Prize Office. Philip Cavendish, Esq., formerly commander of H.M. ship “Tiger,” has complained to the Lords of the Treasury of the detention in the hands of the cashier of 175l. of prize money. Sends the petition for his answer thereto. Treasury Chambers, 15 July 1727. 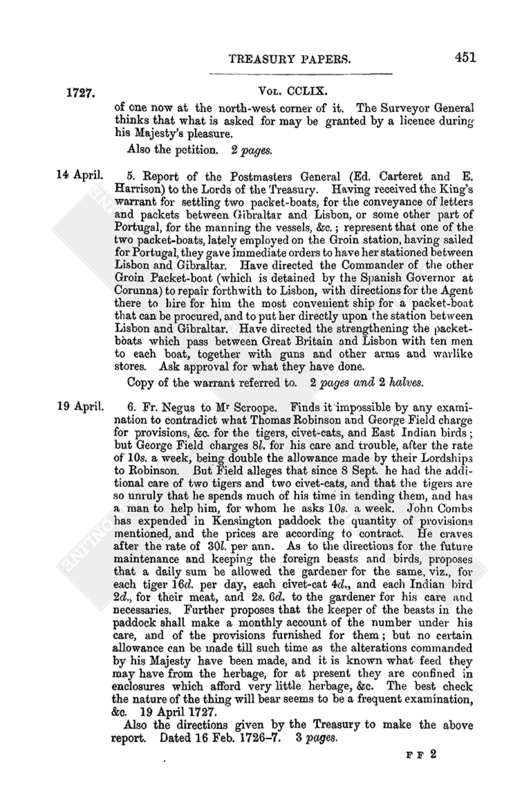 Also the petition which states that the money was detained under the pretence that the petitioner had plundered a prize which he sent into Lisbon. The petitioner prayed that Mr Brucer should give an account why he detained the money, and should make it appear that petitioner did plunder the prize, for which, if he could show the least grounds, petitioner would give up all pretensions to the prize money. 2 pages. 32. Alured Popple to John Scrope, Esq. By command of the Comrs for Trade and Plantations sends, for the information of the Lords of the Treasury, extracts of a letter from Col. Hart, Governor of the Leeward Islands, and of some papers therein referred to, in relation to the seizure of some of the effects belonging to a Spanish vessel lost at Barbuda. Whitehall, July 18, 1727. 44 pages. 33. Copy of an opinion, signed “Thomas Reeve, 25 July 1727,” on the question “Whether the grant of 1696 is not good against the Crown who have now deputed Commrs to sell all the French part of St Kitts yielded thereto by the Treaty of Utricht, or whether the lands in question having by cession at the peace of Reswick leye under the dominion of the French King, the grant to Thauvet is become void?” Thinks (for the reasons given) the grant will survive to Thauvet. 1 page. 34. 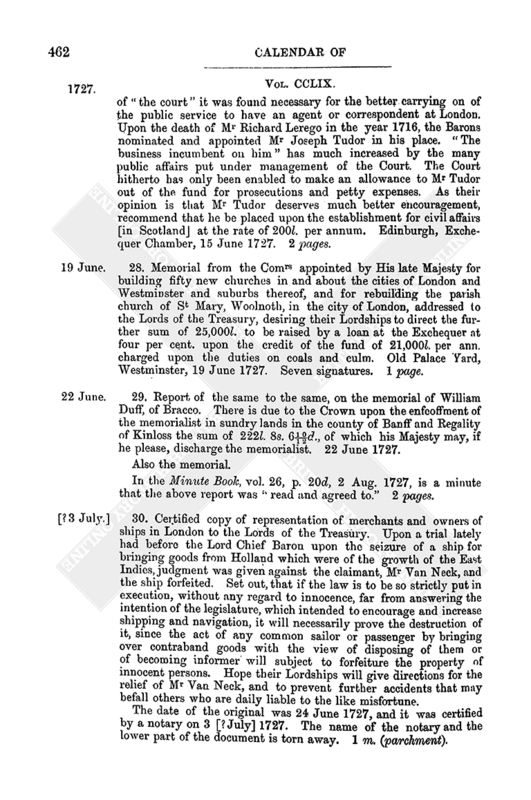 Report of the Barons of the Exchequer of Scotland to the Lords of the Treasury, on the report of the Comrs of Customs, made on the petition of the Earl of Stair, for building a “Key” in Lochryan Bay, and for a grant to his Lordship of 60l. per ann. out of the rents of the Bishopric of Galloway for building and supporting the same. Certify that no further proof has been offered to them as to the conveniency and advantage of having such a key than the papers annexed to the report. And as to the grant of 60l. per annum out of the rents of the Bishopric, they find that the rents and grants made by the King's predecessors to the Universities in Scotland, and other burthens, have so exhausted the revenues of the Bishopric as not to admit of a grant therefrom. But if his Majesty approves of the building the key, there are sufficient Crown rents within the receipt of the Chamberlaincy of Galloway, not particularly appropriated, as to answer the 60l. per ann. which his Majesty may grant. Edinburgh, Exchequer Chamber, 25 July 1727. The report of the Comrs of Customs and copy of the petition referred to; also copy of the above report and copies of two other papers on the same subject. 7 pages. 35. Papers connected with claims on the States General for damages done to Mr Jeronimy Clifford by the Governor of Surinam. The first is of the nature of a petition to the Lords of the Treasury, and commences as follows:—“27 July 1727. My Lords,—In the year 1718 Mr John Denne, of Littlebourn, in Kent, a near relation of mine, gave me an account of the names of 106 relations of mine then living in Kent who are all descended from two brothers and one sister my late father, Mr Andrew Clifford, had. Accompanied by the list referred to, a declaration by the petitioner (described as a “merchant and sugar planter of the Dutch Colony of Surinam in America”) before a notary, that he had appeared and declared that in the year 1718 the account (which is enclosed) of the names of 106 relations of the petitioner, from the first, second, third, and fourth degrees of lineage, who were living in the county of Kent, was delivered to him,” &c., and that he intended to make them his heirs. Also copy of another petition, which petitioner intends to lay before his Majesty in Council, copy of Order in Council of 9 July 1705, an extract from the Resolution of the States General of 16 Feb. 1697 concerning the damages: giving also “a short estimate” of the damages. Besides these there is another copy of the Order in Council, and copies of the 5th, 6th, and 7th articles of peace made with Holland in 1674. There is also copy of another Order in Council of 3 May 1705 on the same subject. 19 pages. The order is dated 12 Aug., and the particulars 11 Aug. 1727. “For the King:”—The Imperial Crown, a circlet, St Edward's Crown. The sceptre with the dove, the sceptre with the cross and the orb (all to be adorned with jewels), St Edward's staff, the gold spurs, the four swords, the ampulla and spoon for the anointing, paten and chalice, and a ruby ring. “For the Queen”:—A circlet, the crown, the sceptre with the cross, the ivory rod with the dove, and a ruby ring. 2½ large pages. His opinion was that the officers, as officers, could not make a seizure because (as he took it) the Commission of the Commissioners of Customs did not extend to that Island. Aug. 23, 1727. 1 page.